In Star Wars #9, Showdown on a Wasteland World!, Han Solo and Chewbacca are leading their team of Starhoppers to a village on Aduba-3 to protect them from Serji-X Arrogantus and his band of Cloud-Riders. Prior to reaching the village, they need to defend the village's crops from the flying High-hounds and Han rescues a female name Merri. It turns out Merri is the daughter of Oncho, the village spokesman. In an interlude, Princess Leia is communicating with Luke Skywalker who, along with C-3PO and R2-D2, is searching for a new base for the Rebellion. Luke's transmission is cut short suddenly and Leia announces she is going to find Luke. Back on Aduba-3, Han and his group are preparing for the fight with Serji-X when Oncho's father tells Han that his help is not needed. Han dismisses the older man's suggestion and shortly afterwards Serji-X and his gang attack. As the battle rages between Han's Starhoppers and the Cloud-Riders, Oncho's father summons a giant monster. The cover for Star Wars #9 show Han, Chewbacca, Amaiza, a shirtless Jaxxon, and Effie firing on Arrogantus' men riding their skyspeeders. Han is firing two blasters. The cover for the British Star Wars Weekly #18 also show the bandits on their skyspeeders, but this time they are flying over Serji-X Arrogantus. On the side of the cover we see the floating heads of Chewbacca, C-3PO, and Princess Leia. Serji-X is holding two blasters. The U.S. cover has several inconsistencies with the interior pages. Jaxxon is wearing a modest outfit and Amaiza is younger inside. On both the U.S. and British covers, the skyspeeders are drawn differently. Inside, they have runners on the bottom, not unlike those you find on a snow sled. In one of the scenes in the comic, the droid Effie grabs a skyspeeder by one of the runners, allowing Chewbacca to attack the rider. Overall, I prefer the U.S. cover, because it better captures the predicament Han's team is in against the Cloud-Riders. 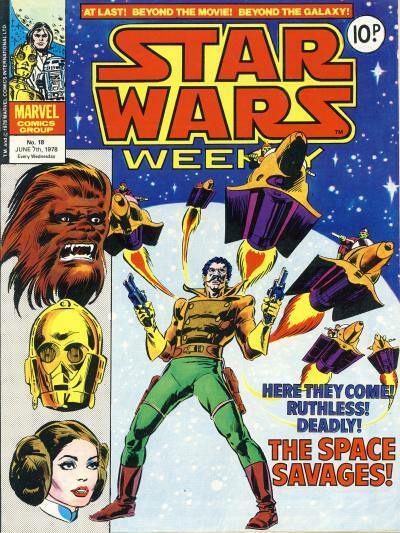 The Star Wars Weekly cover shows Serji-X Arrogantus who does not appear on any U.S. cover despite appearing in three issues. Interestingly, the writer Roy Thomas based the character's name and visuals on Sergio Aragonés, a comic creator who is best known for his work at Mad Magazine as well as creating the comic Groo the Wanderer. Sergio Aragonés writes and draws the one-shot Sergio Aragonés Stomps Star Wars for Dark Horse Comics. "Come on, baby. You know you have more heart than them." - Han Solo to the Millennium Falcon from Han Solo #5. The Millennium Falcon is easily the most iconic Star Wars spacecraft and it was no surprise this popular ship was brought back for the sequel trilogies. It received a lot of applause from audiences when Rey's first choice for transport off Jakku is destroyed and instead she and Finn race toward the familiar "garbage" hoping to evade the First Order TIE Fighters. It is aboard the Millennium Falcon that audiences are reunited with Han Solo and Chewbacca when Han declares "Chewie we're home." Even after the tragic death of Han later in the film, it is clear the Falcon's indelible influence will live on under the stewardship of Rey and Chewbacca. Solo: A Star Wars Story's director Ron Howard has said, "The Falcon is a character in the movie, without a doubt." I know many fans, including myself, will be interested in seeing Han's reaction when he first see the spacecraft that will become an important part of his life. It is clear from the recently released trailer that the Millennium Falcon is going to play a big part in the movie, as it should. 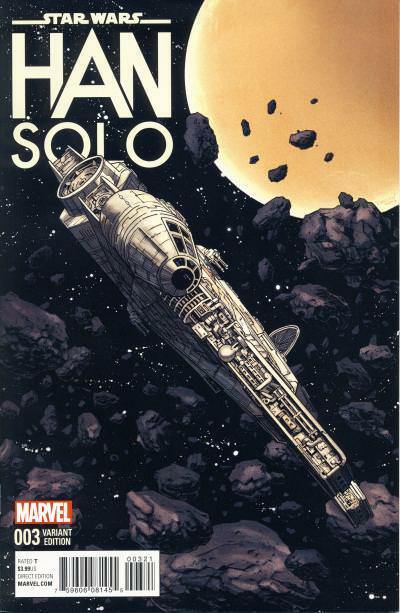 In 2016, Marvel published a 5-part mini-series titled Star Wars: Han Solo. 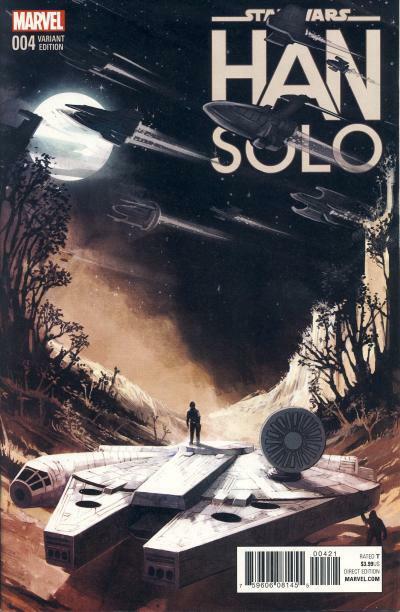 The Millennium Falcon's presence is important to the story; Han is recruited by Princess Leia to fly it in a race, the Dragon Void Run, which is a cover for Han to rescue and transport informants back to the Rebellion. 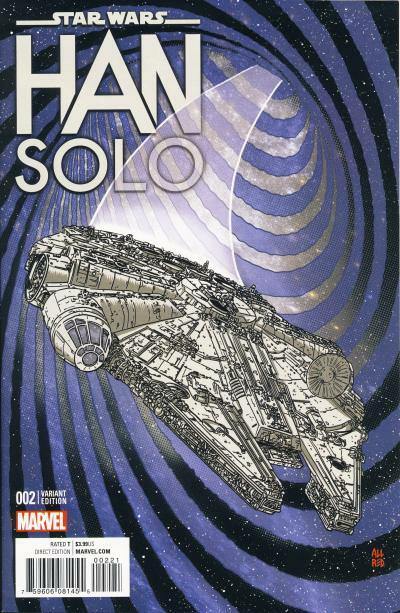 Each issue in the series has a variant cover featuring the Millennium Falcon. 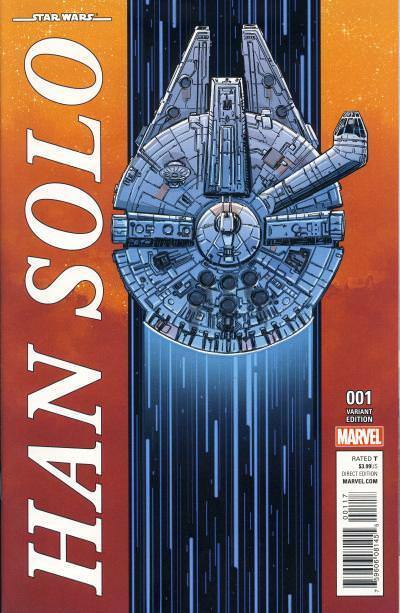 The first cover, by Scott Koblish, is an overhead view of the Falcon. The drawing is meticulous, almost specification-like, and it is framed so the eye is drawn directly to the Falcon, easily the most interesting item on the cover. Mike Allred draws the second cover and his interpretation of the Falcon is very detailed, flying threw a vortex that has a signature Allred look. Declan Shalvey's Falcon is not as bright as Allred's, but he manages to capture an interesting view of the spacecraft flying through an asteroid field. This is my second favorite cover of the five covers. Easily my favorite cover of the entire series, Stephanie Hans drawing for issue #4 is beautiful. Han Solo is standing atop his ship, peering up at the other spacecraft in the Dragon Void Race flying overhead. Chewbacca is prepping the Falcon for flight. 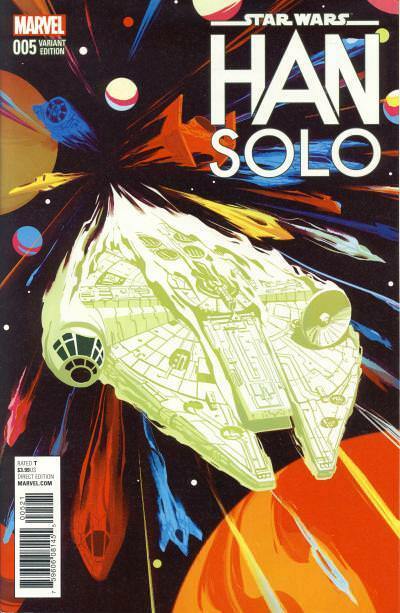 My least favorite Millennium Falcon variant, issue #5 shows brightly colored ships trailing the Falcon. The Falcon is encased in flames. These variant covers were initially distributed in a ratio of 1 for every 10 copies ordered. 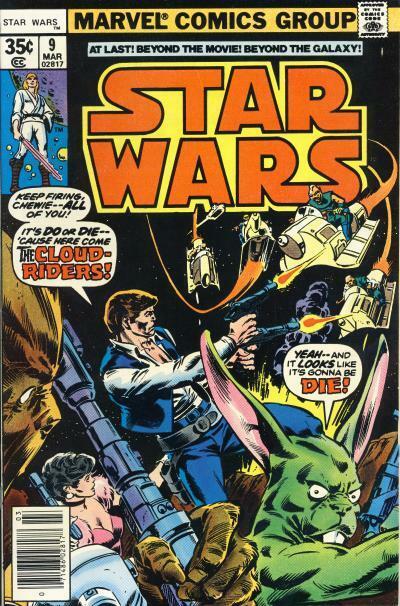 Prior to Star Wars Tales #21, most of the stories in this anthology title were not considered part of canon. This allowed for a variety of stories that were impossible to tell otherwise, such as a meeting between Darth Maul and Darth Vader as well as a crossover between Star Wars and Indiana Jones. Many of the tales in the first 20 issues are humorous in nature. With Star Wars Tales #21, new editor Jeremy Barlow introduced a new direction with stories that are serious in nature and part of continuity. 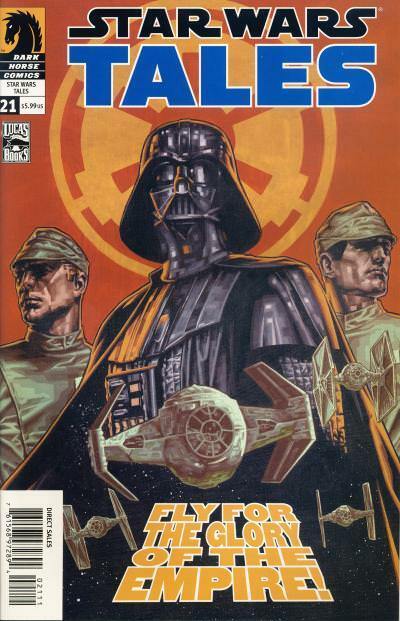 Despite the shift, Star Wars Tales did not receive any noticeable movement in sales and even though Star Wars Tales always sold comparable to other Star Wars titles, the title ended with issue #24. There are three stories in Star Wars Tales #21. The first part of a 4-part story Nomad is presented first and follows Darca Nyl who is pursuing a Dark Jedi named Lycan. In the first chapter, his mission takes him to a planet in the Outer Rim and helps rescue the daughter of one of the founders of the mining colony on the planet. The second tale Walking the Path That's Given is about Nas Ghent, a cynical ex-fighter pilot who fought on the side of the Confederacy of Independent Systems during the Clone Wars. 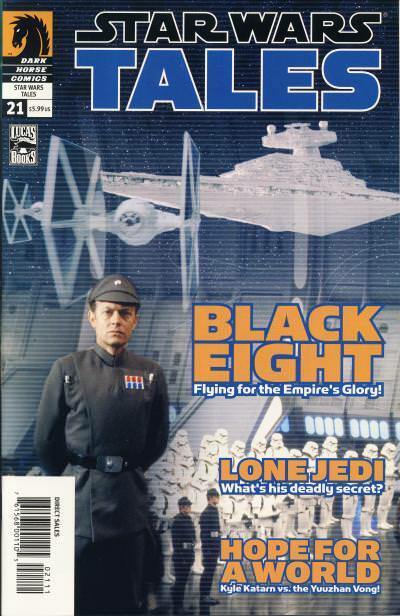 Now a smuggler, he is shot down by and recruited by Darth Vader to build an elite TIE unit named Black Eight Squadron. Ghent is assigned to the Star Destroyer Crucible and placed under the command of Commander Millavec. Ghent and Millavec clash and Millavec plots to kill Ghent on a training mission, but Ghent survives. The incident increases Ghent's resolve to carry out Vader's mission. The final story in Tales #21 is Equals & Opposites and stars Jedi Kyle Katarn and Jan Ors on the planet Ord Sedra freeing captives of the Yuuzhan Vong. Star Wars Tales #21 has both an art and a photo cover. Both covers are based on the story Walk the Path That's Given. Unfortunately, this is the one and only story about Nas Ghent forming the Black Eight Squadron. There were plans to continue the narrative, but they never materialized. This black and white digest-sized comic is from Indonesia. It has an original Star Wars cover and interior story. The main story is titled Planet Crowot. 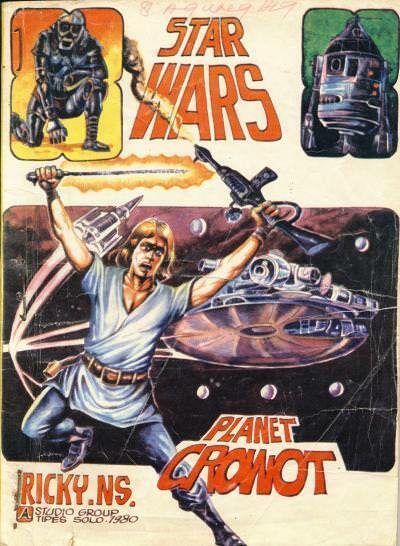 The cover shows Luke Skywalker holding a lightsaber and laser rifle. The bigger ship in the background in the Millennium Falcon and the smaller ship is . The upper left hand corner shows C-3PO and the upper right hand corner is R2-D2. Inside the story also shows Han Solo and Obi-Wan Kenobi and is dated 15-10-1980. The final page of the story shows Luke, Superman, and Thor in the same panel! There are 3 H.C. Andersen (Hans Christian Andersen?) stories: Telaga Airmata or Telaga Shedding Tears with a date of 21-April-1975, Mangkok Kramat or Bowl of Kramat with a date of 29-9-1980, and Panah Emas or The Arrow of Gold with a date of 29-9-1980. The three backup stories seem to star the same characters. It is no surprise that movie adaptations do not sell as well as original stories in the pamphlet format. This was not always the case as the original Star Wars movie adaptation was a huge hit for Marvel. The first issue went back to print seven times in various formats in 1977 and 1978 alone. I'm guessing Marvel has made more money off of Star Wars movie adaptations than all of the other Star Wars comics combined. When you consider the number of times those original six issues have been published around the world, with new collections of these comics being published seemly yearly somewhere on the globe, it is easy to understand why Marvel still adapts these movies to comic form. Those original issues were published 40 years ago and they are still being published today, making these Marvel's equivalent of DC's Watchmen and The Dark Knight collections. Marvel will be publishing a 6-issue mini-series of The Last Jedi starting in May. Like the Rogue One adaptation last year, this series will include scenes not shown in the movie. This tradition goes back to the original Star Wars movie. In the comics we see Luke Skywalker witness Princess Leia's Blockade Runner overtaken by a Star Destroyer over Tatooine, our first glimpse of Luke's friend Biggs Darklighter is in Anchorhead not the Massassi Temple on Yavin, and Jabba confronts Han Solo in Docking Bay 94 in Mos Eisley. Deleted scenes were not just found in the Star Wars adaptation; The Empire Strikes Back told in Star Wars #39 - 44 also contains a few surprises. The Wampa attack on the Rebel base on Hoth is found in the exquisitely drawn pages by Al Williamson, as is a much more intense training of Luke by Yoda and more dialogue from Boba Fett on the bridge of the Executor. Those original comic versions of the movies contained these scenes because the comics were timed to be released to newsstands when movie goers hit the theaters, so Marvel did not know some of these scenes would end up on the cutting room floor. This nostalgia by Star Wars fans for these cut scenes is why Marvel's intention to purposely include additional scenes in The Last Jedi adaptation is a good decision. Star Wars fans not only love what is shown on the screen, but they love what did not make the cut just as much. Please read the article Star Wars: The Last Jedi is getting a comic adaptation over at Entertainment Weekly for more information as well as an early glimpse of two covers that will adorn the first issue.